For a system-wide install, this typically requires administrator access. For an isolated install, you can run the same inside a virtualenv or a venv (Python 3 only). The only dependency is a working installation of Graphviz (download page). The graphviz module provides two classes: Graph and Digraph. They create graph descriptions in the DOT language for undirected and directed graphs respectively. They have the same API. Their constructors allow to set the graph’s name, the filename for the DOT source and the rendered graph, a comment for the first source code line, etc. The node()-method takes a name identifier as first argument and an optional label. The edge()-method takes the names of start- and end-node, while edges() takes iterable of name-pairs. Keyword arguments are turned into (node and edge) attributes (see Graphviz docs). Use the render()-method to save the source code and render it with the default layout program (dot, see below for using other layout commands). Passing view=True will automatically open the resulting (PDF, PNG, SVG, etc.) file with your system’s default viewer application for the file type. Note that pipe() returns the raw stdout from the rendering command (str on Python 2, bytes on Python 3): When piping into plain-text formats like 'svg' or 'plain', you usually want to decode the return value as shown above. The output for pipe() is buffered in memory, so do not use this method if the data size is large. 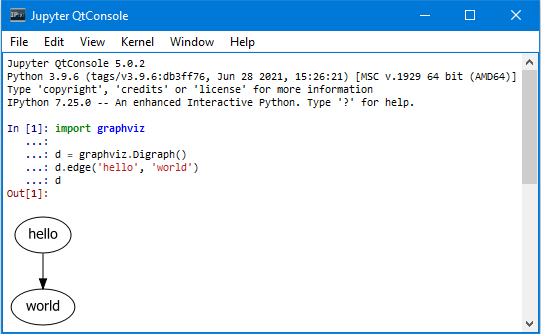 Graph and Digraph objects have a _repr_svg_()-method so they can be rendered and displayed directly inside a Jupyter notebook. For an example, check the examples/notebook.ipynb file in the source repository/distribution (or the same within nbviewer). Use the graph_attr, node_attr, and edge_attr arguments to change the default appearance of your graph, nodes, and edges. "node" -> "\"here's a quote\""
Graph and Digraph objects have a subgraph()-method for adding a subgraph to an instance. There are two ways to use it: Either with a ready-made graph object of the same kind as the only argument (whose content is added as a subgraph) or omitting the graph argument (returning a context manager for defining the subgraph content more elegantly within a with-block). If the name of a subgraph begins with 'cluster' (all lowercase) the layout engine will treat it as a special cluster subgraph (example). Also see the Subgraphs and Clusters section of the DOT language documentation. To use a different layout command than the default dot when rendering your graph, use the engine argument when creating your graph. Note that you might need to correctly quote/escape identifiers and strings containing whitespace or other special characters when using this method. Apart from the missing editing methods, Source objects are the same as the higher-level graph objects (pipe()-method, format, engine, Jupyter notebook repr, etc. ), see above. To directly render an existing DOT source file (e.g. created with other tools), you can use the graphviz.render() function. Other options are viewers that support live updates or using the Jupyter notebook or Qt Console to display the current version of the rendered graph in repeated add/render/view cycles.